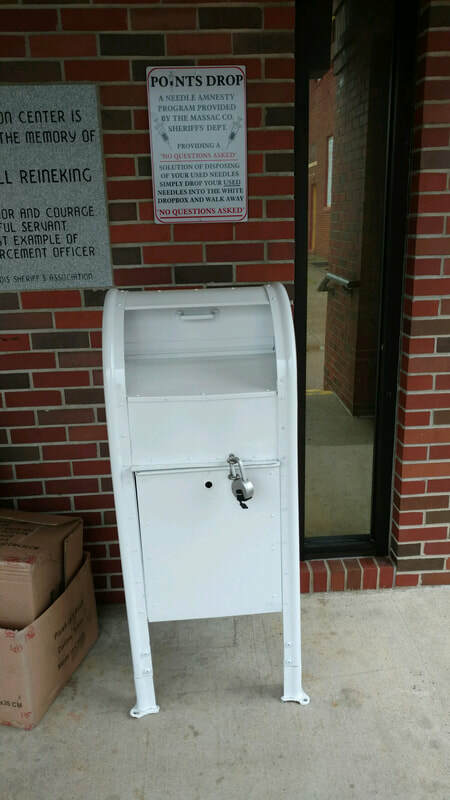 ​On April 28, 2018 the Massac County Sheriffs office started a new program aimed at reducing the number of used needles being found discarded in Massac County. The program named “ Points Drop “ is a Needle Amnesty Program allowing anyone to walk up to the Sheriffs Office and drop off used needles regardless of what is in them. The Massac County Drug Awareness Coalition, Massac Memorial Hospital and the Southern Illinois Enforcement Group has partnered with the Sheriffs Office to make this program happen. Over the past year the number of calls coming into the office has increased about people finding used needles in their yard ,parking lots and near school grounds. We hope that this program will convince people that we are serious about helping protect the citizens of Massac County against the health hazards of used needles and our growing problem with drug abuse.